well as time-lapse photography in daytime and night time settings. 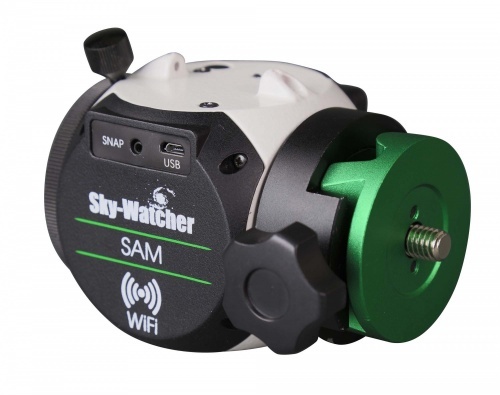 SAM comes with built-in WiFi and the free Star Adventurer Mini Console App for Android and iOS platforms, allowing it to be remotely controlled with your smartphone. SAM is easy to set up and to operate in all of its modes. Star Adventurer Mini Wi-Fi Photo Set: includes the Star Adventurer Mini (SAM) mount, ball head adaptor, polarscope and polarscope illuminator. Sky-Watcher shutter release cables can be purchased separately for most popular camera models/brands. The Star Adventurer Mini Wi-Fi can attach to any standard tripod via its ¼” or 3/8” adaptors. The latitude can be set by either adjusting the tilt of your tripod head to match your latitude or more accurately by purchasing the optional Equatorial Wedge. To fit a camera to the Star Adventurer, either a tripod Ball Head is required (not supplied) or the optional Dovetail L-Bracket. The optional Dovetail L-Bracket can be used in conjunction with the optional counterweight shaft/counterweight.